After some 25 years of life spent working abroad, Alfons Mucha returned to his home country. He wanted to use his experience to work for the nation and promote its origins. His intention was condemned by some critics before he began work on The Slav Epic. The idea was seen as being obsolete, stubborn and unsuitable …. The Epic was widely referred to by the public as a „tragic mistake”, with many artists and politicians, expressing it to be „false mythology“, “a true Trojan horse“ and “a false gift”. With the outbreak of WWII, followed by the oppressive socialist occupation, it wasn’t until 2010 that the works became a National Monument. 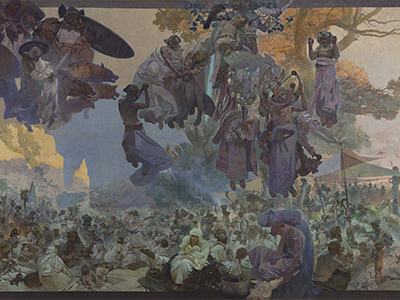 At the time when The Slav Epic came into being, and shortly after it was completed, there was muted appreciation for Mucha’s individuality, the diversity of his work and the devotion he showed towards his nation. In the 1920s, when some of the canvases were finished, they were already traveling to the United States of America, where over 600,000 visitors came to see them. The Epic was named one of the greatest paintings of the 20th century. At present, opinions in the Czech society have changed, yet controversy remains and The Slav Epic is still without the pavilion in Prague for which its author had wished. Meanwhile, over 650,000 admirers arrived at the Tokyo exhibition in 2017 to marvel at the masterpiece.